Scrum is definitely the most successful agile methodology so far. Everywhere you go you can now hear the word scrum in the most absurd context. Scrum roles and titles have partly replaced more traditional titles. Scrum becoming mainstream is not only it being superior to any other option. Today there are two major organizations offering their courses and certification services: Scrum Alliance & Scrum.org. Kanban is not as far with certifications, but the kanban community seems to be heading that way as well. Last year the Lean-Kanban University started to hand out accredited kanban trainer -badges and more recently accredited kanban coach -badges appeared so the writing on the wall is clear. Certifications might not be much to be proud of these days, but does not mean the classes are not any good. Still these classes are as good as the teacher and I for one got very lucky with the instructors I had in my both certified Scrum classes. I had the privilege to attend a certified Scrum Master class by Jim Coplien and he is one of the so called gatekeepers of the official Scrum guide and he´s been around since the digital stone ages. As expected his expertise exceeds far beyond scrum and I still consider it the best crash course in agile. Later I had the chance to attend Scrum Product Owner class by Gabrielle Benefield and that also was as good as a two day class can be. Not because of Scrum, but because of the vast amount of experience she shared with us was not only enlightening, but also inspiring. If my memory serves me correct, I attended the first official Kanban class by David Andersson in Finland. Kanban definitely has merit as a methodology, but you could still tell that the course content nor trainer was not as polished as the aforementioned Scrum counterparts. Now more and more Kanban trainers are popping up and with more trainers and organized courses the courses and their content will get better due to more experience in the kanban community. Classes are as good as the trainers and the certificates are just a semi necessary by product. Certainly classes by different trainers have similar agendas, but the trainers definitely have more than enough room to accommodate attendee requests and add their own spice to it. Still certificates themselves should not be considered essential. 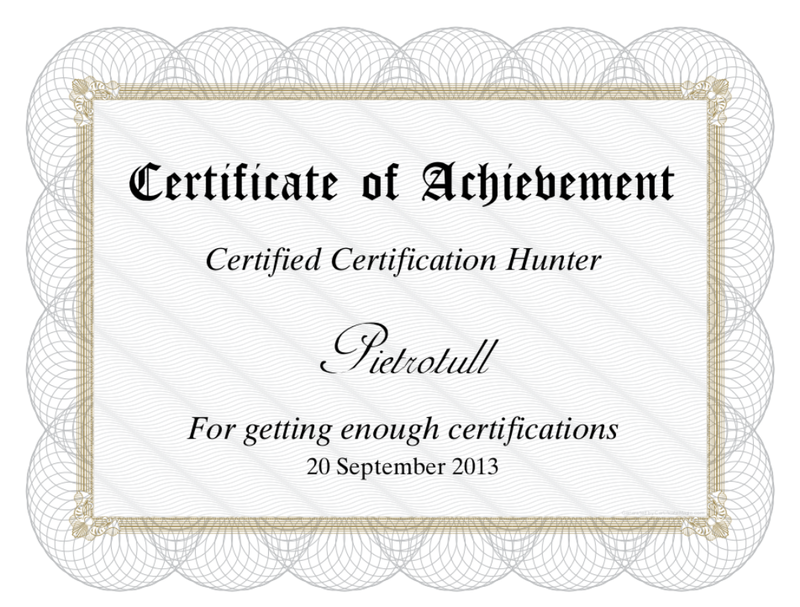 After all you can get a bunch of certificates even from w3schools.com. The bottom line is that although the certificate might not be much to brag about, these well established classes can still provide a lot of value. Posted on 20/09/2013, in Agile, Kanban, Scrum. Bookmark the permalink. Leave a comment.